Haidon Clancy, left, and Austin Waters. Photo by Leon Laing. Our website thought the hunt for the Red Octobers was over. Jordan Stasyszyn told vigoronline that the Nike Air Yeezy 2 Red October is one of the only sneakers that could top the rare kicks from his last expo. One patron wore the Red Octobers at Stasyszyn’s second annual Harrisburg Sneaker Expo on Sept. 7. A vendor brought a pair of those kicks, too. We posted the photo of the patron’s Yeezys, but some people questioned the sneaker’s authenticity. Therefore, we removed the photo, and we offered this link to help sneakerheads identify fake kicks. This year’s sneaker expo didn’t have the best sneaker contest like it did in 2013. Instead, some businesses promoted their sneaker events. Pittsburgh-based iHateShoes will be holding its second annual Buy, Sell & Trade Expo on Jan. 3. For more info, call 412.609.4821, or e-mail shop.ihateshoes@gmail.com. Sneakerheads of Pa. held its Sneaker Party on Sept. 14. Fat Joe and Armageddon performed after the sneaker party. Sole Providerz was a vendor last year and returned this year. The Scranton-based business boasted one of the biggest selections of kicks at this year’s expo. Fishbone Apparel and That Fresh Pair are some of the newcomers to the expo. Austin Waters is a dead head. When I say dead head, I’m not referring to a Grateful Dead or The Walking Dead buff. Waters, 22, owner of That Fresh Pair in Harrisburg, has an affinity for deadstock sneakers. Deadstock sneakers have never been worn before. Waters, who runs his business with friend/business partner Haidon Clancy, will be holding Night of the Living Deadstock on Oct. 26. The event is a sneaker/costume party. Visit facebook.com/thatfreshpair for more info. Our website shoots the breeze with Waters. That Fresh Pair LLC was established July 28, 2014. You said if you don’t have the sneakers in stock, you’ll guarantee that you can order them from somewhere else, correct? I specialize mainly in preorders for new Nike and Jordan releases. My connect uses Eastbay, and I can get up to 60 pairs of a style depending on release. I also have connects for sneakers that have already released, which I consider as inventory connects. What are some benefits for buying deadstock versus a used pair? The benefits of buying deadstock are: You get to rock your pair while they are still in their original state . You get to put the wear and tear on them yourself. Plus, people love that new shoe smell when they come out of the box. I believe it makes more of a statement, especially if you keep them clean … It can also say what kind of person you are and what your financial status is. Sneakers have more meaning to them than most people think. What do think about the sneaker culture in Central Pa.? I feel like it’s growing. Even younger kids are getting involved. There are young entrepreneurs and sneaker connoisseurs now. It’s exciting to see how the sneaker culture is evolving, especially here in Central Pa.
Below is another more pic from the expo. 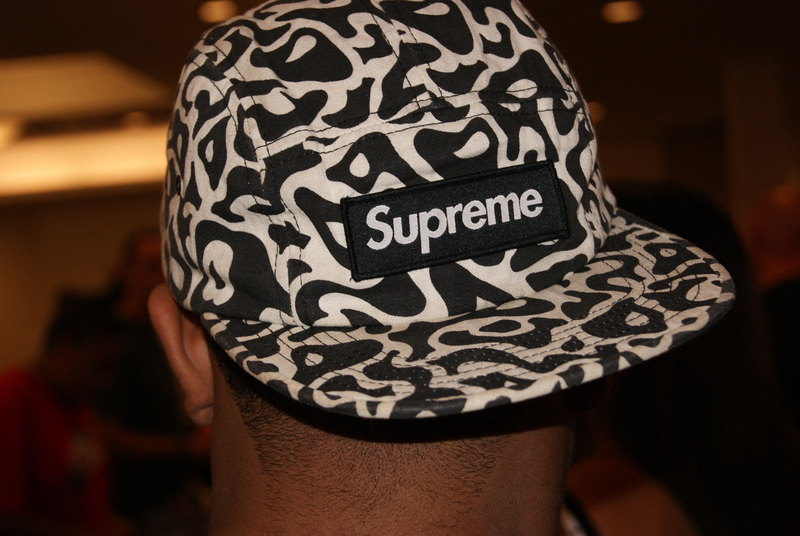 Supreme hat. Photo by Leon Laing.